Can you still get famous on YouTube and how much money can you make? Can you still get famous on YouTube and how much money can you make? 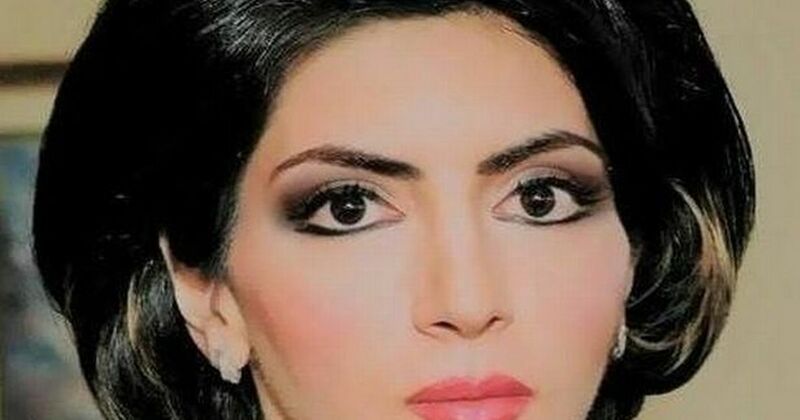 Last week a women named Nasim Sabz armed herself with a handgun, shooting three innocent employees at the YouTube’s headquarters, before taking her own life. And why? 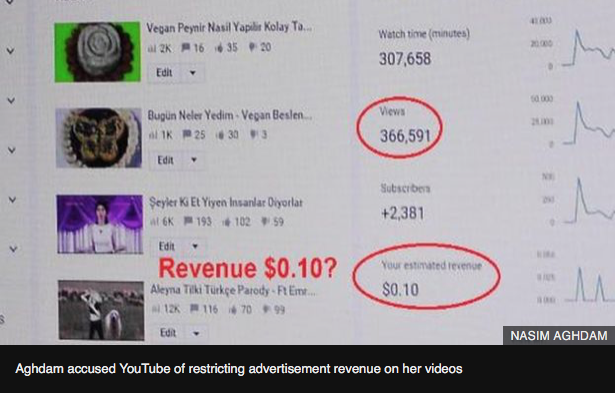 Apparently cause she made only 10 cents on YouTube for a video with more than 300.000 views. She also claimed: "There is no equal growth opportunity on YouTube or any other video sharing site. Your channel will grow if they want [it] to!" I don´t have to tell you, that I obviously do not agree with her, shooting completely innocent people. That is pretty clear. However, I wonder, if her statement above has a little truth to it. Obviously Nasim Sabz wasn´t happy that she did not get "YouTube famous" and earned the money that she felt like she deserved. I watched a couple of videos of her (reposted from other channels as her own YouTube channel has been deleted by YouTube after the shooting) and her videos are pretty cray cray- but you know: we all like different stuff, right? I mean my son watches YouTube channels, that I think are super dumb. You can think what you want of that women, but she definitely is an artist (in my opinion). In fact some of our biggest artists suffered from mental illness: not just van Gogh (who had hallucinations and bipolar disorder and may I remind you: cut his ear off), van Beethoven suffered allegedly also from bipolar disorder, or Edvard Munch who created his famous painting "The scream" while hallucinating (I actually had an oral examination on exactly that painting in high school! Like someone hallucinates and paints this and I have to analyze what the painter was thinking? He probably couldn´t remember himself lol). But, the question remains: is there an equal growth opportunity on YouTube- or not? Is actually YouTube deciding who gets famous, or is it really just the people watching the videos? But just why? Why was this video in the "Trending" section? That boy shows a quick view of a couple of corn-fields in Iowa. That´s it. There is nothing in that video that deserves to be "trending". Absolutely nothing. Thousands, probably more- video creators are uploading meaningful videos that take hours of editing, and here comes YouTube, puts this video in "Trending" and that boy receives millions of views and thousands of subscribers within days! His channel was created on Mar 16th, 2018!!! Hell, I am on YouTube since 4 years and I never got 11.000 subbies and I uploaded more than 260 videos while this boy has uploaded 7 (crappy) videos!!! LOL! I also think it is very ironic that this video got in the "Trending" section shortly after YouTube announced their new guidelines (in which you need to have at least 1000 subscribers and a total watch time of 4,000 hours in the past 12 months to be accepted in the program). And with making this "unimportant" video viral, it seems- yet again- possible to get popular on YouTube overnight. Makes me almost think, if YouTube did this on purpose? So that small video creators don´t stop uploading free content FOR YouTube. So there you have it: all you need to have success on YouTube is to be featured in "Trending". So, Nasime might have had a point here: "Your channel will grow if they want [it] to!" "Trending helps viewers see what’s happening on YouTube and in the world. Some trends are predictable, like a new song from a popular artist or a new movie trailer. Others are surprising, like a viral video. 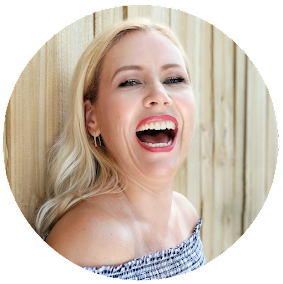 Trending aims to surface videos that a wide range of viewers will appreciate." (Read the complete explanation here). Hm, I find this is a really weird explanation on what "Trending" is. 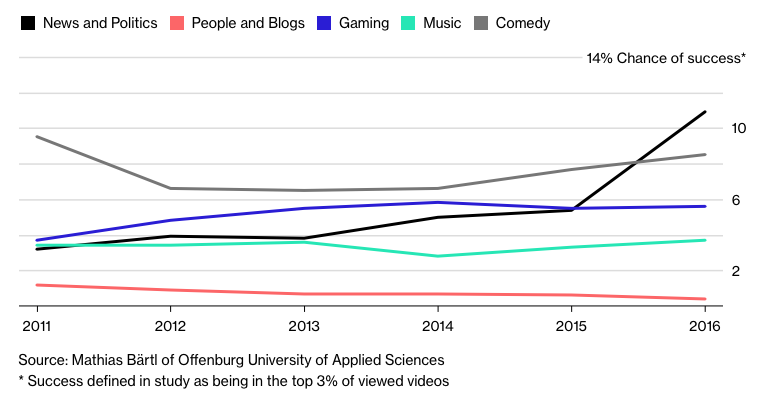 Especially "Others are surprising, like a viral video"- but isn´t it exactly the opposite? A video becomes viral BECAUSE it was in the Trending category? I saw with my own eyes that the "Iowa video" at first did not have that many views. And now it has Millions of views! And it has those because it was "Trending". 10 cents for 300k views? Back to Nasim: did she really just make 10 cents for a video? 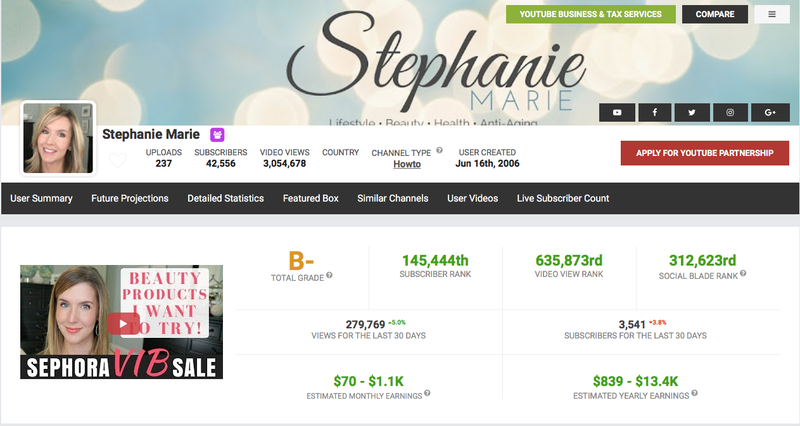 According to Socialblade she made an estimated $23-$373 monthly- or $280-$4.5k yearly. 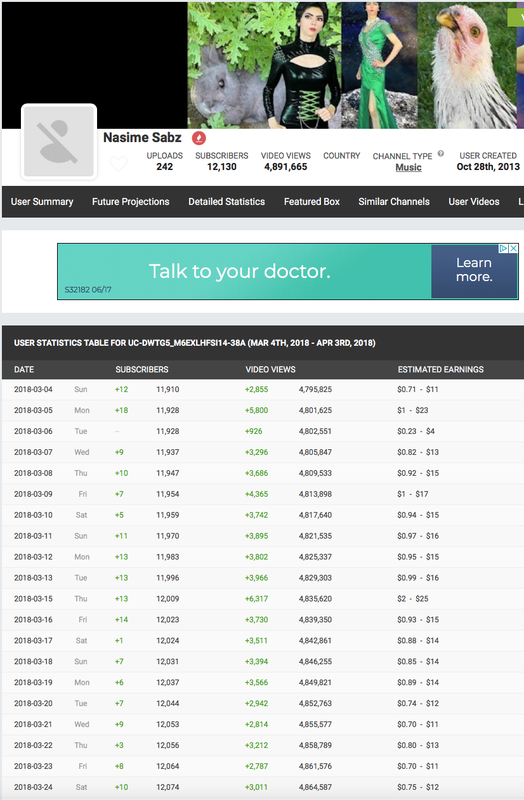 I know from my own experience that the data on Socialblade is pretty accurate and the correct number is usually a little more on the higher end of the range. Let´s say that women made $4000 a year. Surely not a number where you can live from. But she also had only 12k subscribers and she uploaded only 242 videos. 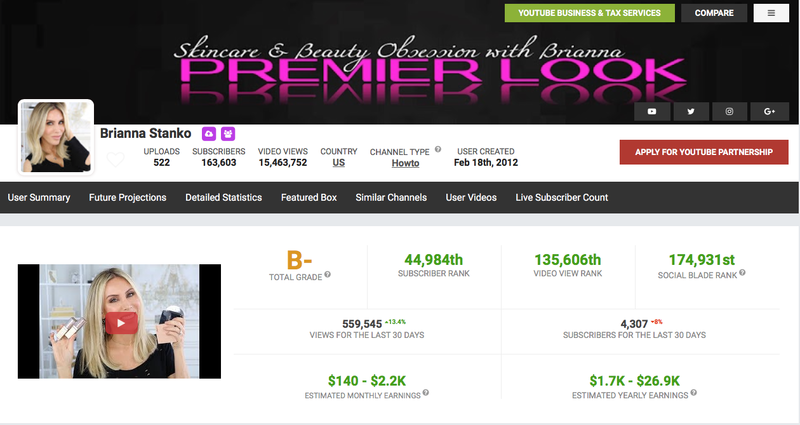 However, her video views (and that is the only number that counts for the ad earnings!) are almost 5 Mio- which is pretty good for a small channel. Here you can see a little more detailed, how much she made daily in the right column. Unfortunately the tab of her videos is gone, since YouTube deleted her channel, so we can´t say for sure, if she got only 10 cent for a video with more than 300k views. However: it is possible that she showed us for example the analytics of a video for a certain time frame- such as 1 day. 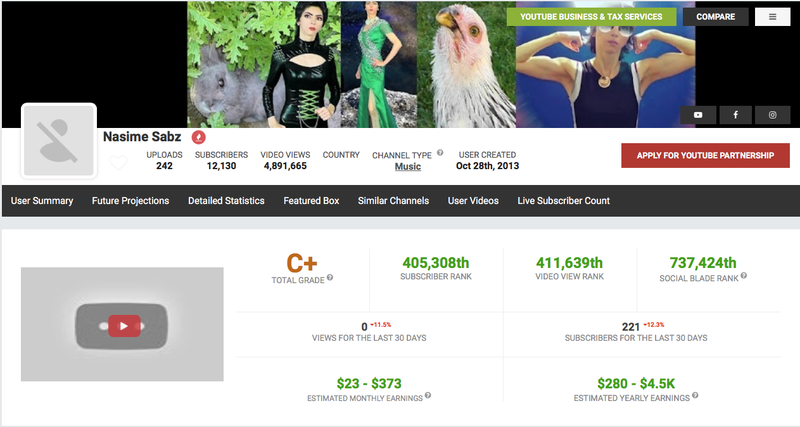 As you see in the chart above in the right column: she received usually something that is higher than 69 cent (per video per day). It is possible that the video that received the allegedly 300k views contained "inappropriate content" and wasn´t suitable for ads and therefor she did not generate the revenue that she felt like she should. 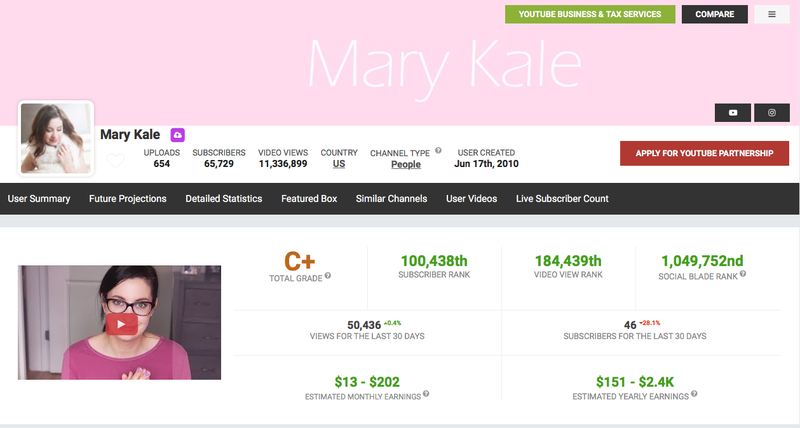 So, while it is possible that she might have really earned only 10 cent for that video, she definitely earned in total more than only 10 cents. I know nobody can live from $4000 a year- but hey I made only roughly $1200 last year on YouTube lmao. 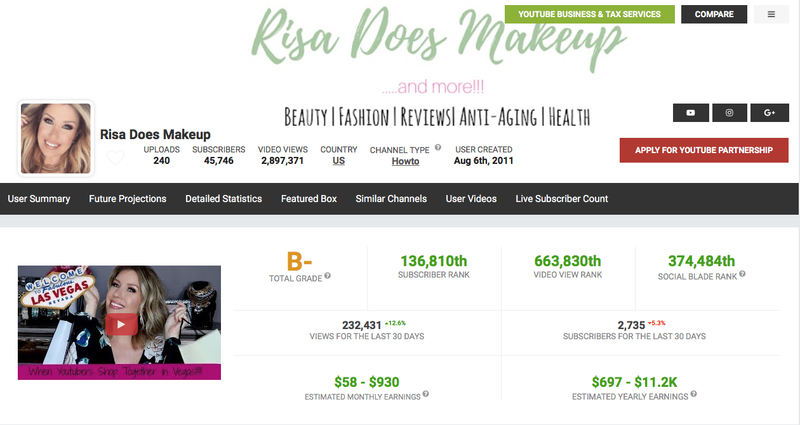 Risa does Makeup has 45k subscribers, almost 3 Mio views and makes about 11k a year. Nice, but you can´t live from that. Would you have thought you make only 11k with 45k subbies? Mary Kale (such a sweet one!) has 65k subscribers, more than 11 Mio views (that is huge!) and makes only approximately 2k a year! What?!? Brianna Stanko has 163k subscribers (wow! ), more than 15 Mio views (double wow!) and makes approximately 26k a year. Yes, you can make a living out of that one- but not really a good one lol! 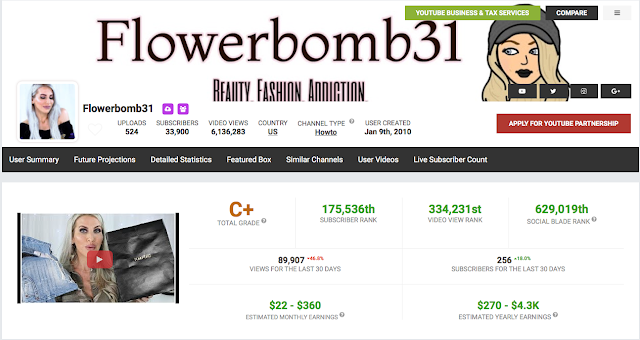 Flowerbomb31 has 33k subscribers, more than 6 Mio views and makes about 4k a year- this channel is very comparable with Nasime Sabs as they made about the same video views. Melissa55 (is such a darling, watch her: the most charming 60 year old grandmother that looks younger than I do! ;-) has 73k subscribers (Congrats Melissa, fully deserved!) with more than 6 Mio views and makes about 8k a year. Stephanie Marie has 42k subscribers with more than 3 Mio views and makes approximately 13k a year. It is important to note that the subscriber number has no relevance in regards of your YouTube ad revenue. Again: subscribers don´t bring you any revenue- only the video views do. None of the above mentioned channels make a "real living" off of YouTube and they all have more than 30k subscribers and more than 3 Mio views. So while Nasime Sabz maybe thought she was paid unfairly on YouTube- she completely lays in line with all the other YouTube channels: she had almost 5 Mio views and made $4000 a year- the same that Flowerbomb31 made with 6 Mio views. YouTube isn´t easy and the problem is that it seems so achievable to make an income, because we all know some channels that REALLY bring in money (or at least we thought they do lol). Who doesn´t want to make money at the convenience of their own home? But YouTube is not a company that hired us as an employee. It is their platform and they can do whatever they please with it. And we have to abide to their rules. And those can change in an instant (as they just did). In fact: any paying job will probably pay the ladies above more, if they invest the same amount of time. If you are on YouTube, make sure you have fun and don´t expect to make a living! But the question remains: is there an equal growth opportunity on YouTube, or not? According to a recent study 96.5% of YouTubers don't make enough money off advertising to pop above the U.S. poverty line of $12,000 a year. And being in the top 3% of most-viewed channels may bring in ads worth around $17,000 a year. BTW: the category matters! "News and Politics" chances of succeeding have gone up rapidly since 2015, followed by comedy and gaming- on the other hand it’s become even more difficult to succeed by just vlogging (“People and Blogs”). It is so sad that in this world so many let themselves define by social media. Nobody should define their happiness on their success on social media. Nasime almost killed 3 innocent people, because she did not become "social media famous". 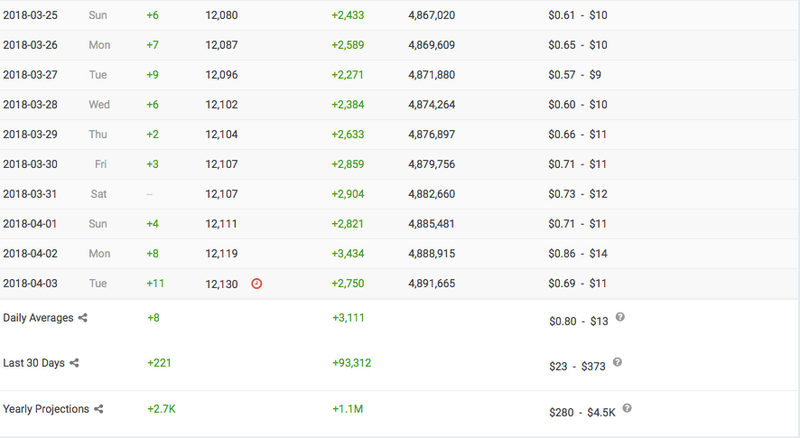 YouTube is not like a regular job where you can -almost always- guarantee that you will succeed with hard work. Remember: You can’t guarantee you’ll be able to do it as a job. Read also: "Why you will never be successful on Youtube". Did you ever hope that YouTube can replace your job?